Just in time, I was able to make it to the Art Gallery of Ontario‘s “Abstract Expressionist New York” exhibition before it closes on Sept. 4. If you have a chance to get there this weekend before it finishes up, I would definitely recommend a visit, not least to see the renovated AGO and salivate over their future plans (large Chagall and Picasso exhibitions are both planned over the next year or two, among a host of other shows). I won’t say too much as I hope to be able to write a longer review later on, but the current exhibition, on loan from MoMA, explores the roots of the Ab Ex movement in Surrealism (Gorky), American landscape painting, the urban architecture of New York, and of course the near-mystical aims of this group of painters. Although there were exceptions even within the loose movement, overall the artists of Ab Ex sought to transcend previous centuries of art history in pursuit of a new, improvisational way of painting that could access the spiritual and sublime. 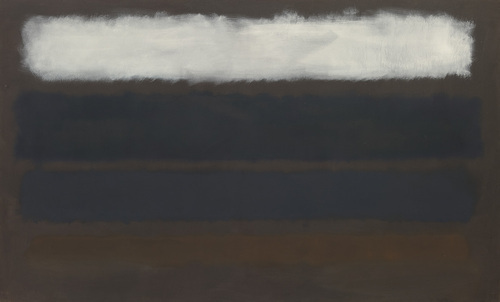 In Mark Rothko‘s words, here are works that summon some of the greatest aspects of human experience: “tragedy,” “ecstasy,” and “doom.” Not just meaningless shapes and colours, these are large-scale, non-representational expressive manifestations of what Kandinsky had earlier called “the spiritual in art.” The chance to stand in person in front of one of Rothko’s colour field paintings, or an original Jackson Pollock (especially the magnificent “No. 1A, 1948”) is not one that comes around very often and indeed for me was not unlike a spiritual experience. 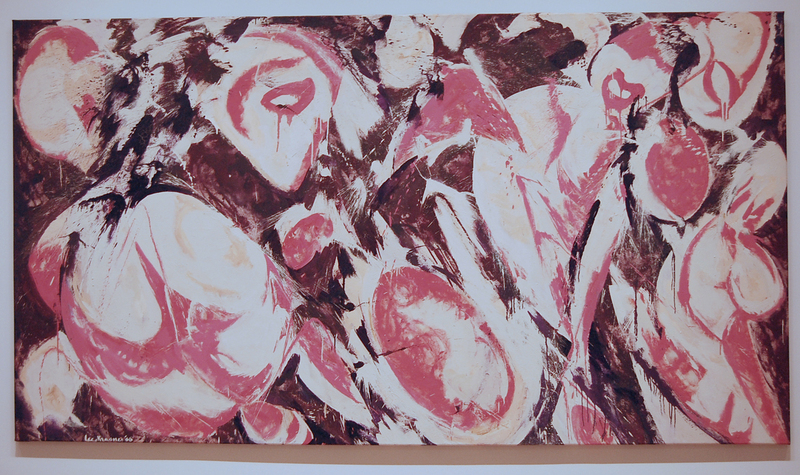 One of the pieces that stood out for me (and apparently lots of the other people crowded into the gallery space) was “Gaea” by Lee Krasner. Krasner is best known as Jackson Pollock’s wife, but appreciation for her own work as a painter is on the rise. This reproduction pales in comparison to the massive original, dulling the vibrancy of the pinks, but you can get some sense of the dynamism of this ode to the earth. 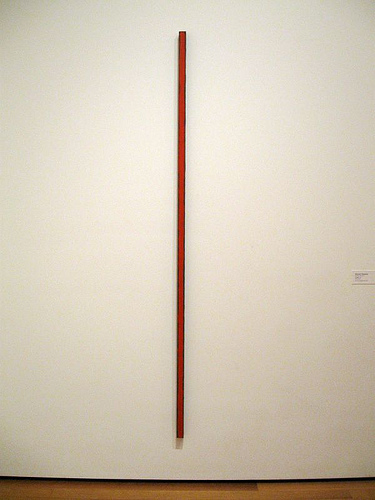 I was also pleased to see that Barnett Newman was well represented, as he is one of my favourites and I will be presenting a paper on him at the American Academy of Religion conference in November. His “zips” looked marvelous in person, and in particular being able to look at the nearly-all-black “Abraham” (just a few feet away from Ad Reinhardt’s even blacker “Abstract Painting”) was worth the price of admission. Newman dealt with not just “universal” spiritual themes but Judaeo-Christian religious concepts in his work – particularly in his Stations of the Cross, intriguing for a Jewish painter – and so for me especially I think there is a lot to explore in his graphically simple work. Other big names in the show include Robert Motherwell, Franz Kline with his black-and-white, nearly representational shapes, Adolph Gottlieb and Clyfford Still. 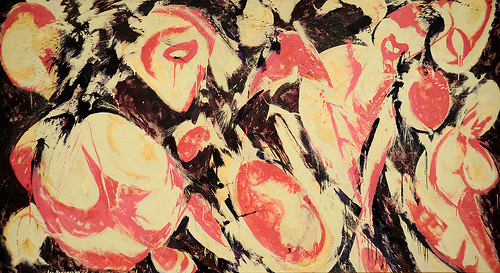 The show did not restrict itself to paintings, and so also showed the influence of Abstract Expressionism on drawing, photography (Siskind and Frank) and sculpture. The final room in the exhibition featured Philip Guston, whose eventual movement away from abstraction to ironic, representational, even cartoon-like pieces signals the end of the Ab Ex era. As the exhibition guides note, this was an American movement, built on the principles of individual freedom and breaking free from (European) tradition. However, considering the dark political realities of the twentieth century, it is certainly open to critique from both a political (how “American” was it?) and metaphysical (is this the kind of art appropriate in an age of injustice?) standpoint. I did take a very brief tour around the rest of the AGO, and was impressed by the beautiful building as well as some interesting curatorial choices. Where else can you see a piece by Cindy Sherman beside a van Dyck portrait? A quick walk through the Henry Moore sculpture gallery reminded me of trips to the AGO as a kid on class trips, all those solid-looking rounded forms reposing in the light. Finally, in the contemporary Inuit gallery I was intrigued by a piece by Bill Nasogaluak called “Sedna on Cross,” a soapstone carving of a crucified mermaid-figure. Very interesting… a definite collision of cultures, although with reverence or critique in mind it’s hard to tell. All in all I think the AGO is looking much better these days, on a par with some of the other large provincial/state galleries I’ve seen in different parts of the world, and the Abstract Expressionist exhibit is definitely a coup as far as making great art accessible to a wide public. RThanks for your comments on my Sedna piece. My title for this piece is ‘The death of my culture.’ Sedna is ourbiggest Inuit legend. In this piece she represents the westernization of our culture, the loss of our language, traditions etc. Thanks Bill… I’m pleased and humbled that you took the time to respond to my very brief reflection on your evocative piece. I would love to do some more reading and reflection in this area!